I seldom feel that my work fits easily into contemporary textile exhibitions – it often looks too colourful, or too decorative, or even too old fashioned in its simply stitched narratives…but recently I have work exhibited in a group exhibition that feels like I belong. 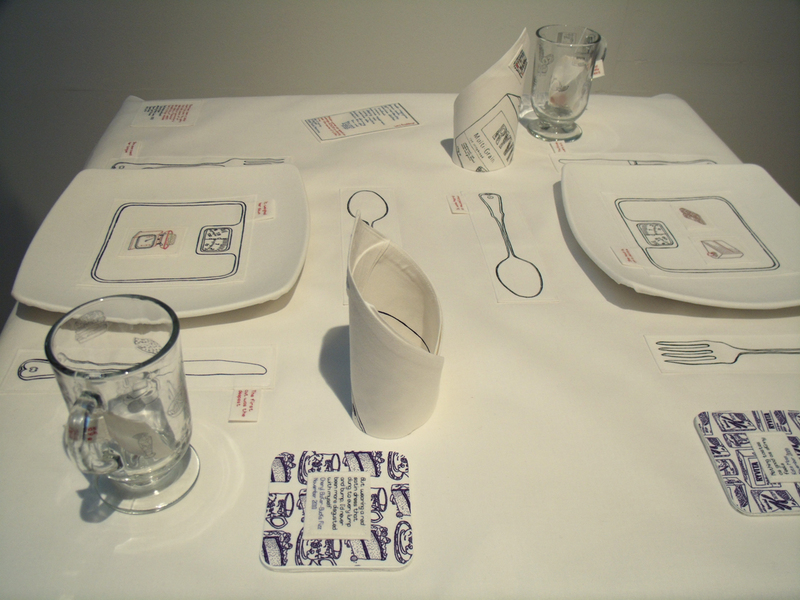 “Construct – eight textile artists explore identity” is showing at the Ruthin Craft Centre in North Wales. 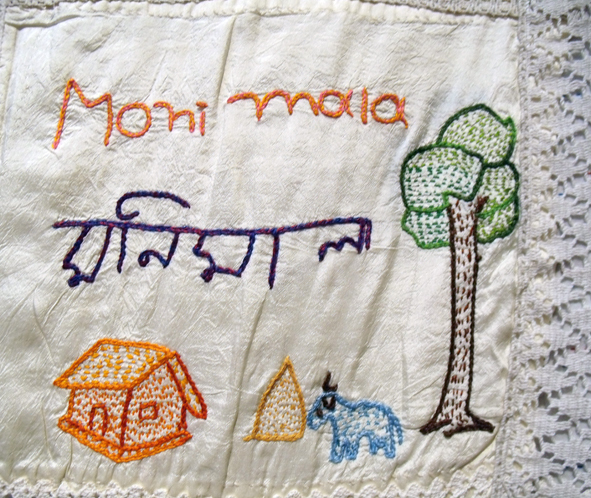 Much of the work is expressed in the form of stitched domestic textiles: tablecloths, curtains, quilts and some clothes, and so my own embroidered counterpanes, bolsters and pillow cases of dreams feel very much at home. I was invited to submit work earlier this year by Dr. Melanie Miller whom I met when we both gave presentations at the Textile Society’s annual conference, Embroidering the Truth in 2013. Melanie’s presentation was an up to the minute resume of textiles by recent graduates from MA courses; mine was an overview of my embroidered narrative commissioned works over the past 40 years. Melanie worked with June Hill to quickly bring a focused exhibition together and also developed with Lisa Rostron, at Lawn Creative, an excellent and beautifully produced catalogue – well worth buying for a stand alone document even if you don’t catch the exhibition. Walking into the exhibition space the large and airy gallery looks fresh and the work on the walls looks clean and tidy – it also looks resolved. I often feel that much modern art textiles look like work in progress, like they have just been snatched out of the hands of the maker – full of possibilities and open to suggestion… but here is a varied range of ideas on identity, simply expressed with a rare degree of intent. 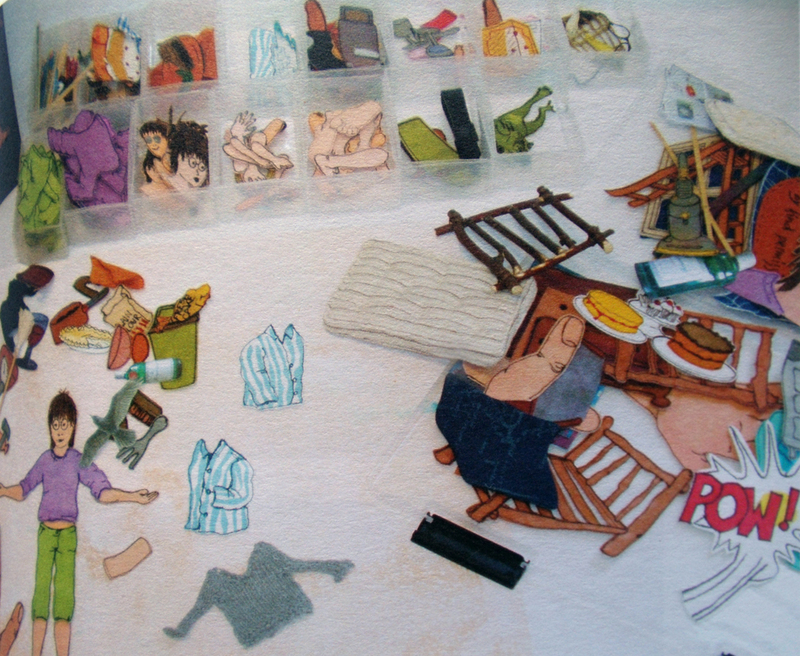 Several of her pieces depict ranges of domestic tasks that usually fall to women to manage; the relentless repetition of her imagery, whether patched, printed or embroidered, echoes the repetitious nature of all domestic work, after all – a woman’s work is never done. 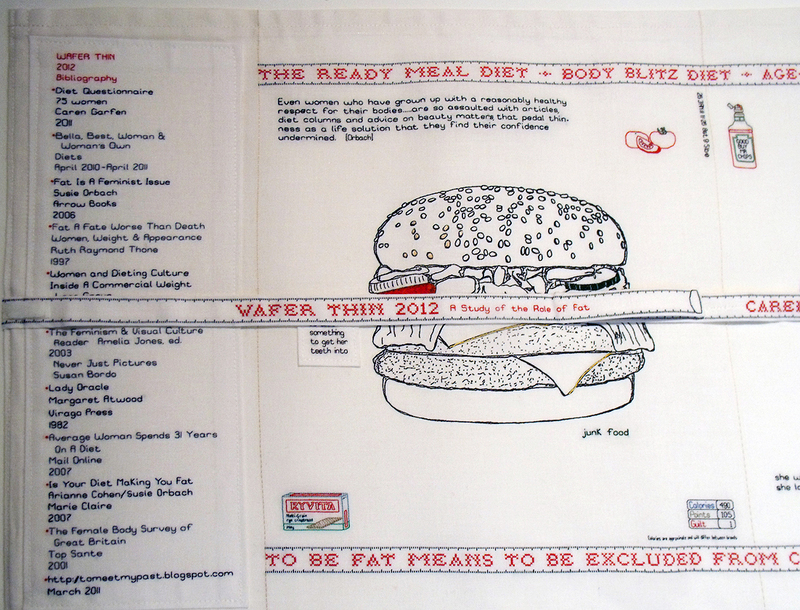 The roll of fabric printed and hand embroidered for ‘Wafer Thin’ is 10 metres long! 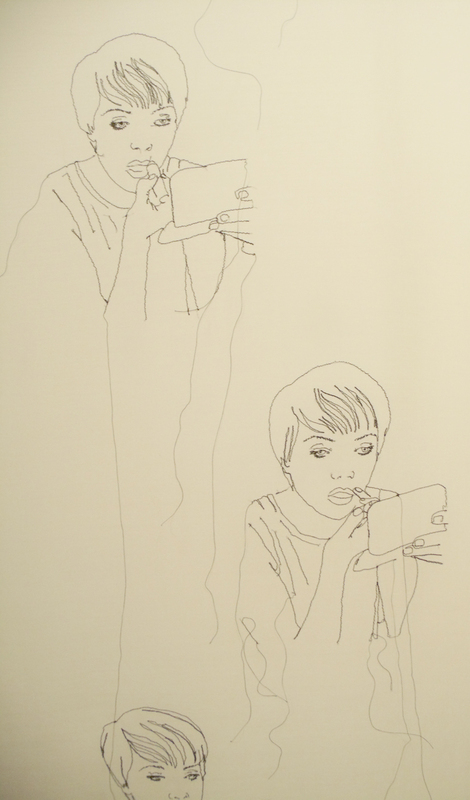 Repetition is also a device used by Naomi Ryder – she records a daily task for many women – putting on make-up; for some a chore (me), for others a delight. 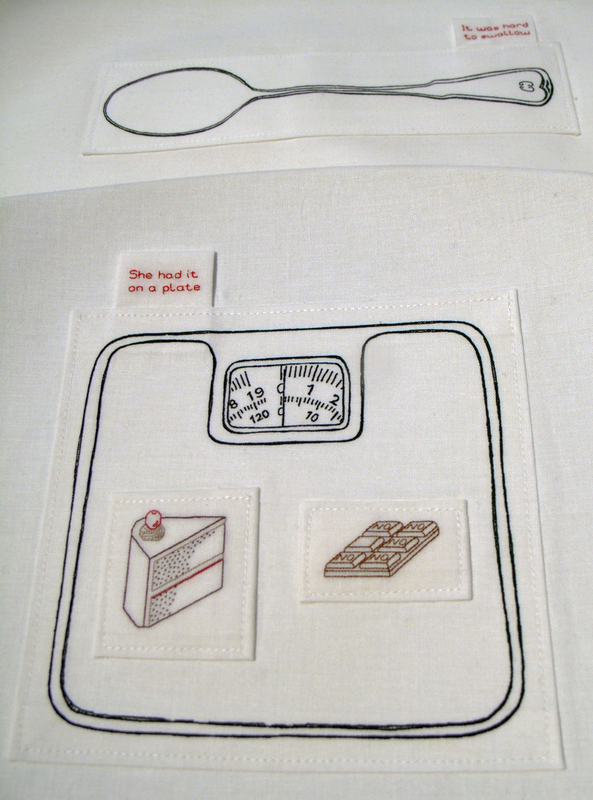 By repeating the same but slightly varied image over a length of fabric she shows the time and energy spent on getting our public ‘identity’ in order before we go outdoors.The continuous daily tasks that women are expected to devote their time to – cleaning, ironing, shopping – she depicts by machine embroidering acutely observed small-scale line drawings onto lengths of sheer fabrics that recall net curtains. Women’s work undertaken to construct an acceptable public identity is a subject shared by these 2 makers – but what of the men? Interestingly Nigel Hurlstone, I know, takes extreme care over his own personal presentation but as yet has never chosen to reflect on this in his work. Nigel’s powerful group of stitched photographic portraits of men who have been very carefully costumed, create an ambivalent atmosphere – half jolly japes and half menace. 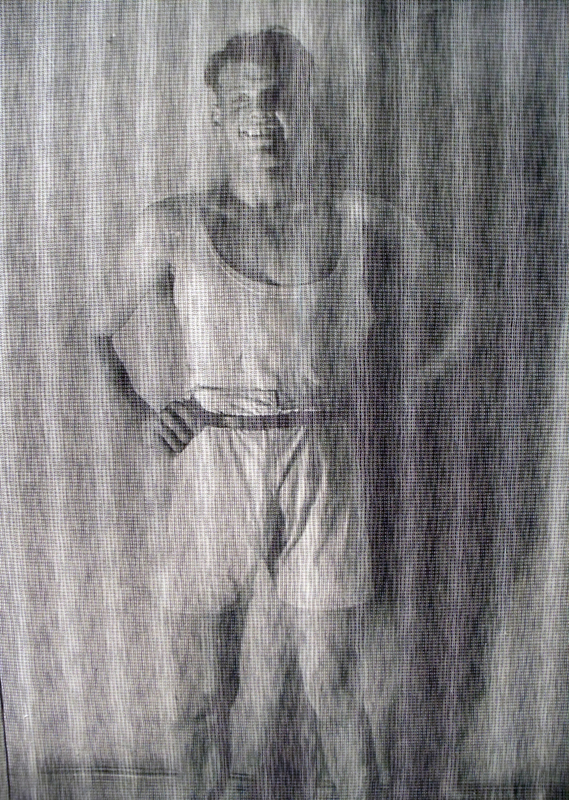 The 9 pieces of work shown are based on a set of portraits of young men, taken between 1918 and 1950, in what could be construed as ‘fancy dress’ but presumably dressed up , or down, for the sexual delight of the photographer. The men were dressed either as street urchins or soldiers and they were apparently picked up on the streets and then posed to conform to a sexual identity desired by the photographer…to my mind they look to be highly amused by the proceedings….. 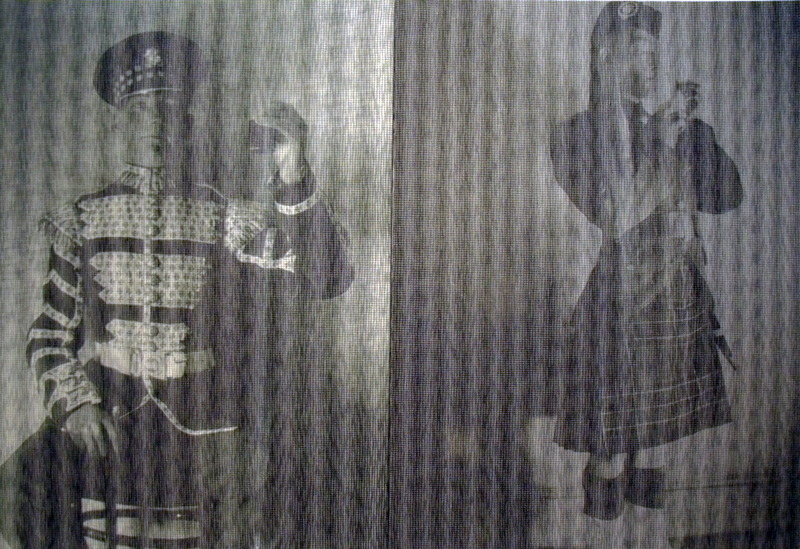 However – the tight rows of machine stitching make the fabrics look like moire or water-marked and obscure the almost life-sized photographic images. I think this makes them initially more easily accessible to the viewer as we aren’t exactly sure of what we are seeing. The actual fabric is compelling, you can’t ‘read’ it easily and this allows the viewer an excuse for deeper scrutiny – close up and personal. The original subject matter was never meant to be for the public gaze, at first glance the men look happy though not exactly innocent, but somehow when we are closer we are aware of an undertow of sleaze or is it menace? War and its effect on women’s change of identity is clearly a personal issue for Val Jackson. Her work deals with reflections upon her mother’s life – the uneasy transition from performing vital and fascinating war work in contrast to the traditional role of wife and mother. Inheriting her mother’s effects, including her correspondence during the war, made it clear to Val that this transition had been difficult. 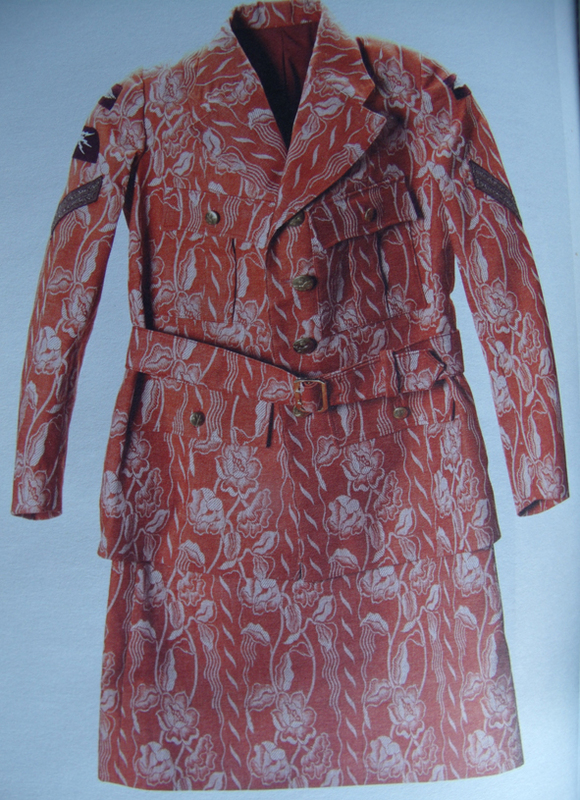 The arresting burnt -orange curtain fabric uniform very neatly combines the 2, opposing? halves of a woman’s working life – the professional and the private. From my own observations of friends and colleagues, the pull between motherhood and making your own work as an artist is a major modern predicament. Linda Barlow uses humour and cartoon representations to depict the complexities of managing this situation. Based on interviews with 8 such women she has made a short animated film – ‘Artist Mothers: a series of observations regarding the frustrations of being an artist and a mother”. It does what it says on the tin – refreshing not to have a punning title – I am guilty of the over use of puns myself…note for later. Women artists often choose to who work within a community – I always think that this is half way between being a social worker and an artist and a really decent thing to pursue. 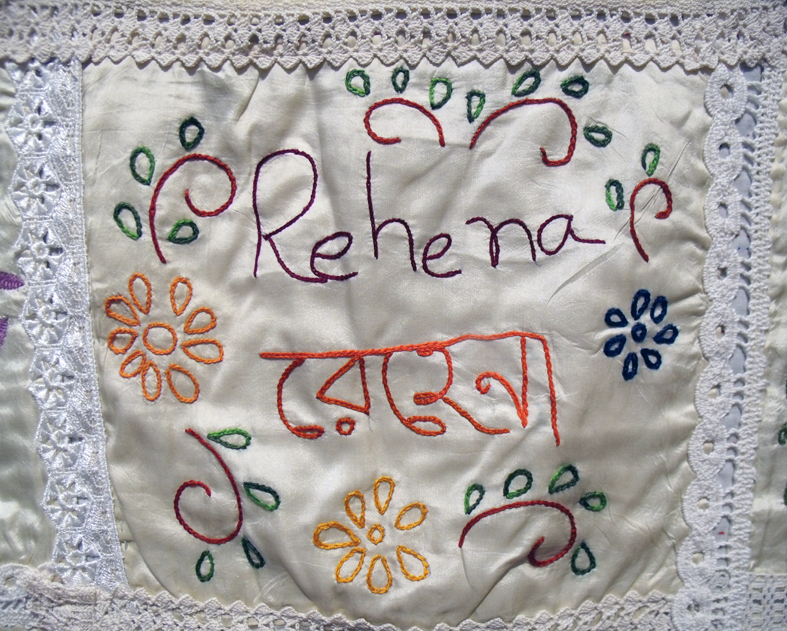 Two such people have this type of work exhibited; Deidre Nelson,who has chosen to work around the world, using textiles as a means of defining the social history of an area, often working with local groups of people, and Lyn Setterington – who makes quilts based on the Kantha technique. Lyn also works on textile based projects within communities; quilt making is historically a community based production, so her own interest in the history of her chosen medium makes a natural lead to this activity. 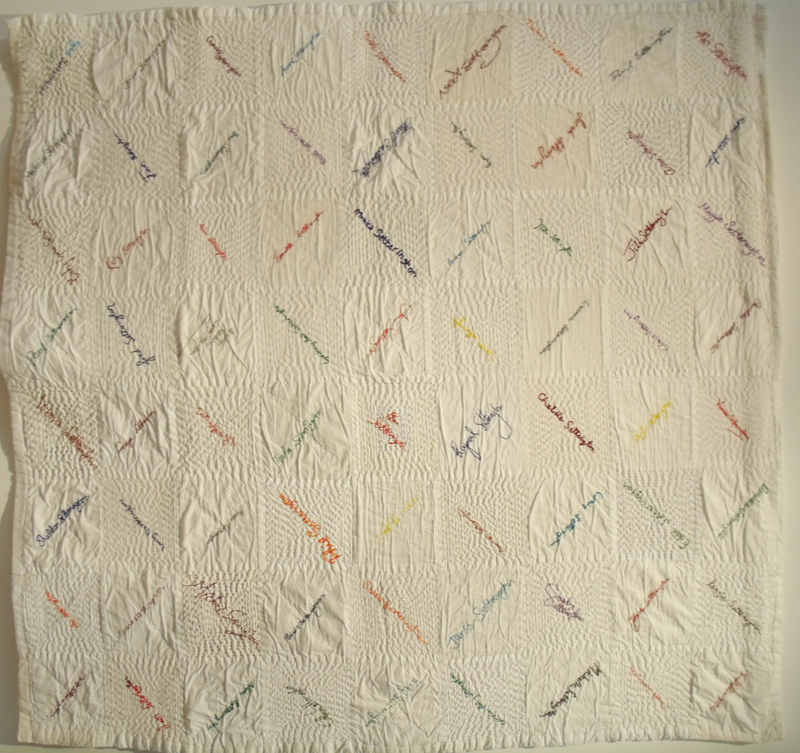 She has recently become fascinated by Signature Quilts and I share this interest – Crazy Quilts – which fascinate me, often contain signatures and messages and they do make the mind start the journey to who exactly made this. 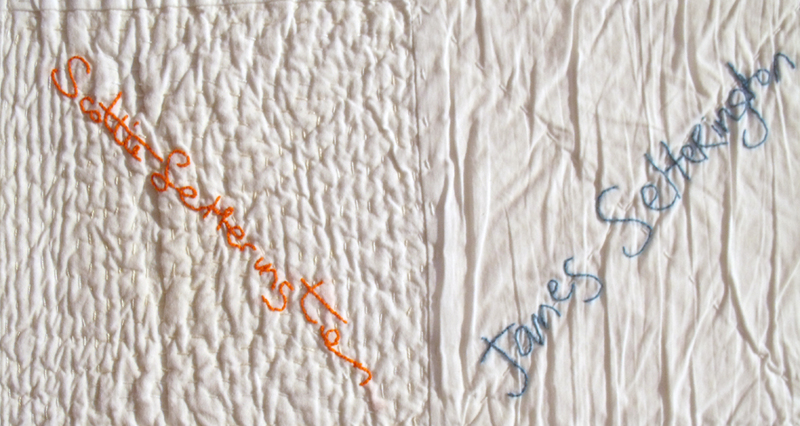 There is at present, in artists’ textiles, a fascination with writing as evidenced here – and as part of the education programme at Ruthin Craft Centre I have undertaken to teach 2 workshops for different styles of hand stitched writing while the exhibition is still showing in July. 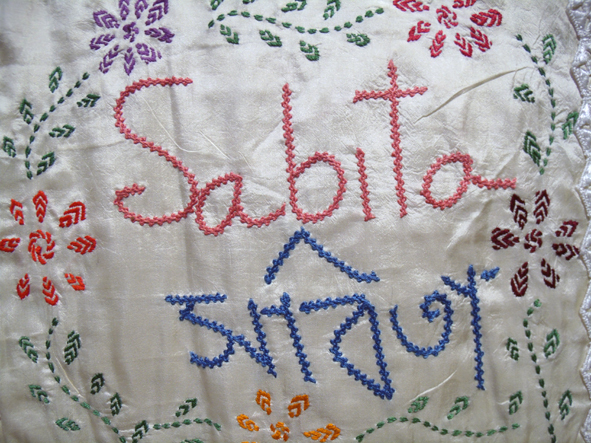 I enjoyed the wealth of embroidery that was evident on the quilts. Rich in many different stitches they are a testament that decorative embroidery is alive and well somewhere in the world. I can see pattern darning, running stitch, chain stitch, back stitch and coral knot just in these 4 samples as well as crochet and Broidery Anglaise even if machine made. 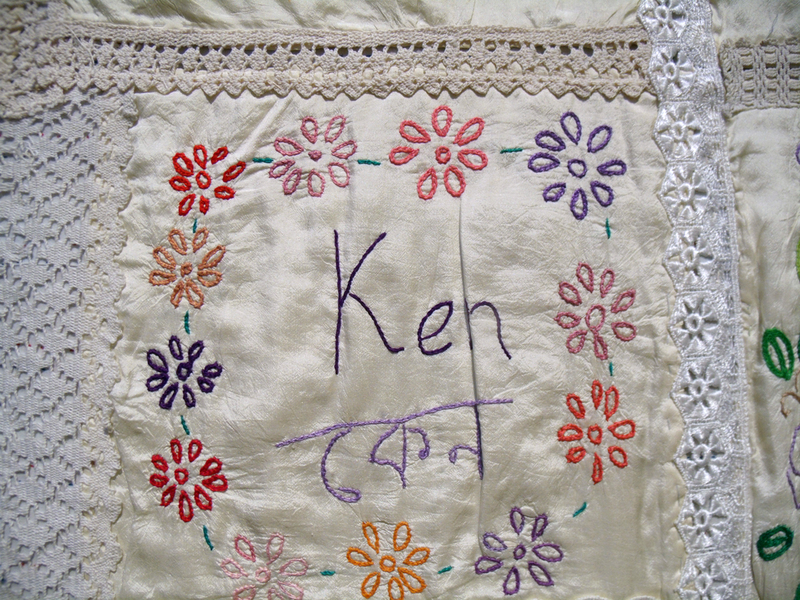 I also like the change in “taste” that this quilt brought to the exhibition, they had so much energy and joyfulness – but maybe that is just a reflection of my identity as an embroiderer at heart. 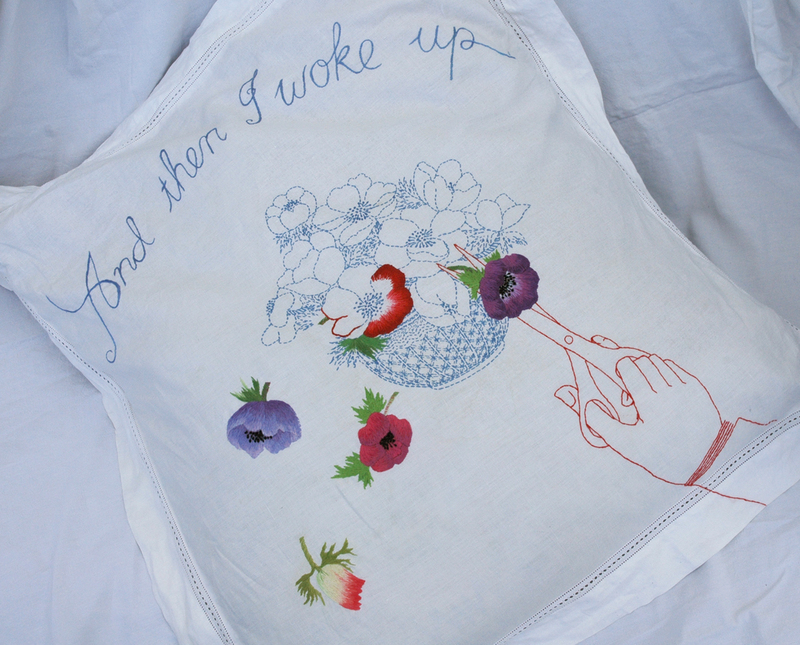 Categories: Make It Through The Night, Stitching | Tags: embroidered boys, embroidery, stitched messages | Permalink. This looks like a great exhibition and i especially love the last series of images here Janet, do you have a photo of the entire quilt by any chance? I’ll have to try and make a treck to North Wales otherwise! Hi Christina, no I am afraid I do not have an image of the whole quilt as these images were taken at the PV so I had to keep dodging other people and the light was reflecting badly off the satin surface. BUT I do think that Ruthin Craft Centre is really worth the treck as the whole place is really vibrant with private studios open to the public and a good cafe as well. Thank you Janet, I’ll add it to my ‘Road trip” file! 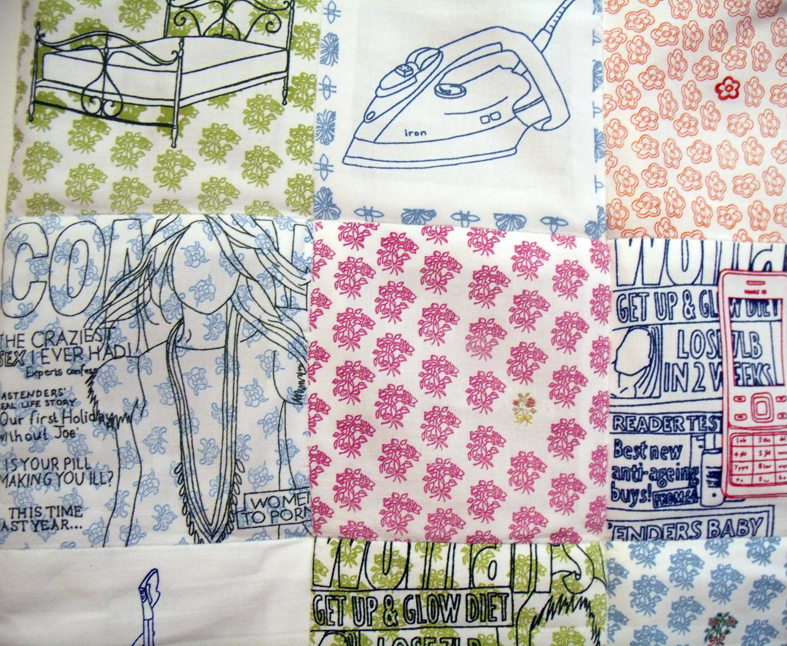 i came across your post while trawling around the subject of signature quilts – i’m not a quilter but am considering putting together a “signature piece” for a forthcoming group project – lynn’s quilt and approach have caught my attention so i will be following that up – thank you for the signpost! the signature quilts have a long tradition for works to celebrate community and now with our access to products for marking with water soluble pens they are easy to achieve. 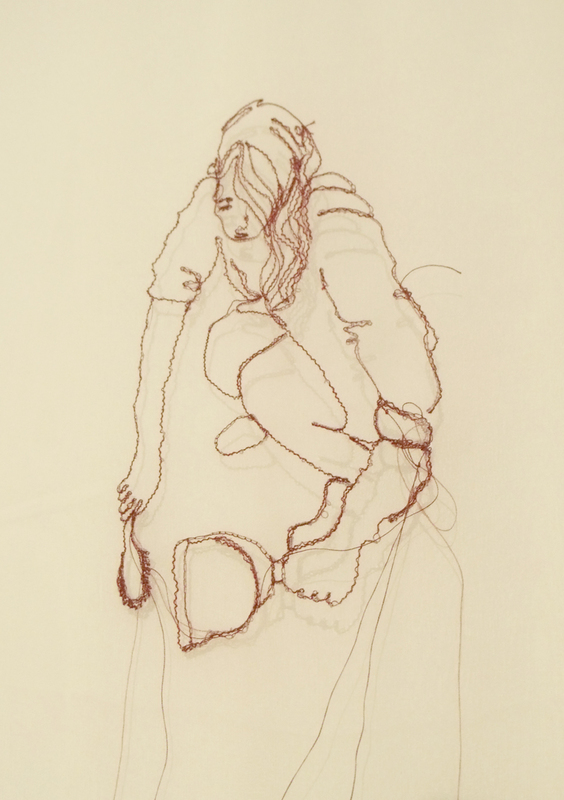 I hold regular classes at Heart Space studios for embroidering writing, and have included it in my “ongoing work”. Often the simplest stitches work out best – small running stitches are my favourites for larger signatures and to get people to write bigger get them to stand up to write their signature – the arm movement affords bigger writing…..I find this works in my classes. split stitch is best for smaller signatures and back stitch is a good basic that most people can manage to make look OK. And get people to follow their writing rather than just fill in the lines – this helps the flow and gives ease to the signature.